Profender Spot on for Cats is one of those rare pet medications that really just gives a customer everything he or she could possibly ask for. It treats a wide variety of intestinal worms, it actually treats lungworm-a notoriously dangerous pest, it goes easy on your cat’s delicate system—treatment can begin when a cat is only 3 weeks old, and it is incredibly affordable for all of the protection it offers. It’s quite a bargain no matter how you look at it. This Bayer product actually does what every sales pitch claims to do: gives you more for less. First let’s talk about Profender Spot on for Cats’ efficacy. It treats, prevents, and eliminates existing cases of all of the following: roundworms, hookworms, tapeworms, and the aforesaid lungworms. Every single major ascarid is wiped out with an added bonus of taking out a life-threatening lungworm infection as well. That’s a great deal of coverage for a single medication. What really sets the spot on for cats apart from the rest of the competition is that it isn’t even a monthly dosage! Think about every other medication you’ve ever heard about. How often can any of them boast one treatment per 90 days? That’s just plain excellent kitty cat coverage. 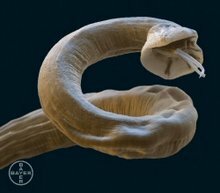 Roundworms, tapeworms, and hookworms are always annoying and potentially harmful to an otherwise healthy kitty, but they pale in comparison to the threat posed by a lungworm. This insidious parasite resides, procreates within, and inflames the respiratory system of your cat. This can cause serious health complications for even the heartiest of cats. It’s a problem that can’t be tolerated, and they can be very difficult to treat. Which is what makes it amazing that such a simple and affordable treatment like Profender Spot on for cats can do the trick so easily. Another awesome attribute of Profender Spot on for cats is that it’s available to cats with worms of almost any size or age. As is previously mentioned, the earliest a kitten can be treated with Profender is at three weeks. That just goes to show how powerfully effective the medication is, while simultaneously remaining daintily sensitive and unintrusive to the cat’s natural processes. This is due, in part, to the easy delivery system for the drug to take effect. A single drop on the back of the neck and your kitty is covered for 90 days. Easier isn’t always better, but this is definitely an excellent exception! Perhaps you’ve noticed by now how often the term “affordable” keeps coming up in reference to this incredible spot on for cats. Well, there’s a good reason for it. One treatment which lasts for three whole months is just under $8.00. 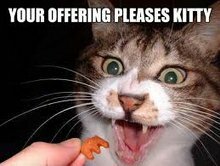 If you don’t have your jaw on the floor, then you probably haven’t been paying for cat medications very long. It’s a phenomenal deal and readily available as always at your favorite online pet supermarket: Petbucket.com. Having cats with worms is an unacceptable problem. Grab your supply today!